Organization History September 10, 1997, Giovanni Catalano and Guido Cornacchione gathered their thoughts about creating an Italian/American Club. Founders Giovanni Catalano, Guido Cornacchione, Gino Pelligra, Gino Brienza, Bill Basso, Emilio Cornacchione, Jack Anello, Nicola Mammone, Marco Beggiato, Domenico Cornacchione, John Petzker, Robert Frattaioli and Steve Chiarappa. Association Name January, 1998, the association name was established. 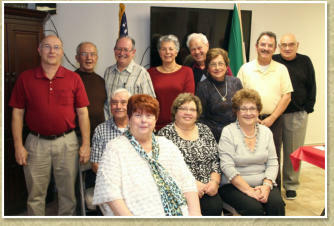 'The Italian Cultural Association' was created as a non-profit organization. First Officers Giovanni Catalano - President, Gino Brienza - Vice-President, Steve Chiarappa - Treasurer, Emillio Cornacchione - Secretary Organization Nickname Suggested by Marco Beggiato, 'Le Radici' (The Roots) was adopted. Incorporated January, 1999, incorporated under 'The Italian Community of Akron' as a charitable organization. The Italian Community of Akron, Inc. (Ohio), 'Le Radici' was established to serve the Italian-American community of Akron, surrounding communities and all those who love Italy. The main objective of our association is to promote educational & cultural activities introducing to the community the different facets of Italian culture. We provide charitable fundraising with Italian themes. Le Radici targets the whole community with no distinction of regional origin or age group. We are a 501 (c)(3) charitable organization and place an emphasis on supporting our community. The Italian Community of Akron, Inc. (Ohio), 'Le Radici' was established to serve the Italian- American community of Akron, surrounding communities and all those who love Italy. The main objective of our association is to promote educational & cultural activities introducing to the community the different facets of Italian culture. We provide charitable fundraising with Italian themes. Le Radici targets the whole community with no distinction of regional origin or age group. We are a 501 (c)(3) charitable organization and place an emphasis on supporting our community.